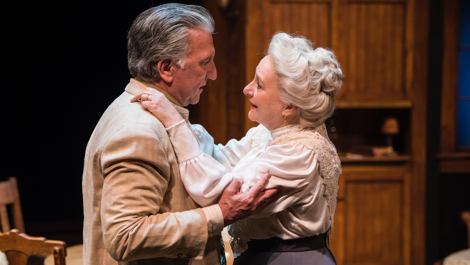 It takes a bit of hubris to mount a new production of Long Day’s Journey Into Night at the Stratford Festival. Eugene O’Neill’s masterpiece directed by Diana Leblanc and starring William Hutt as James Tyrone and Martha Henry as Mary Tyrone was one Stratford’s landmark hits of the 1990s. It premiered in 1994, was remounted in 1995 and was made into an award-winning film later that year. The present production directed by Miles Potter is the first the Festival has staged since then. While it is very good, the perfection of the ensemble acting that made the earlier production so nuanced and so powerful is missing. The ending of the earlier production, even on second viewing, was utterly devastating. The ending of the present production feels merely like the logical conclusion of all that has come before without the former’s strong emotional pull. Nevertheless, the present production has its own revelations to make. If you happen never to have seen the famous 1990s Long Day’s Journey, the current production still ranks as one of the better one this reviewer has seen. The reason for this is that Potter understands the trap that all four members of the Tyrone family are caught in. On the single day O’Neill portrays two events happen that are on everybody’s minds but that everybody fears to discuss. The first is the suspicion that Mary Tyrone, home after a spell in a sanatorium to cure her of her addiction to morphine, has begun using again. The second is the suspicion that the younger son Edmund is not suffering from a “summer cold” as Mary believes but has consumption, the same disease that killed Mary’s father. The three male Tyrones have kept the possible seriousness of Edmund’s condition from Mary because they have feared the news would drive her back to morphine. Now, it seems her general fear about Edmund’s ill health has done so despite their efforts. The three male Tyrones all plead with Mary to stop since she has only just started, but, as a true addict, she denies everything. In fact, she claims that the men’s suspicion and continual watching of her every action has made her long for escape. obliterate it with drink as in the case of the three men or with drugs as in the case of Mary. The great virtue of this particular production is that Potter makes certain that we see that the men’s drinking is no different than Mary’s drug-taking. The Tyrone men have such an idealized view of what motherhood should be that they view Mary’s habit as abominable while viewing their own as a natural pastime. Potter, however, highlights those portions of the play in which O’Neil parallels the men’s behaviour with Mary’s. James Jr. (called Jamie) deliberately drinks until he passes out. Edmund’s favourite moment happens to be the same as Mary’s, namely of being lost in the fog and completely cut off from everything. James Sr. goes about looking for the one positive affirmation of his past as an actor in just the way Mary goes about looking for her wedding dress. The play is most shattering when the plot is framed so that the men’s hope for the future depends entirely on Mary’s actions. Here Potter demonstrates that the men have done very well at sabotaging their own futures themselves and that Mary’s actions are better seen not as a reaction to the men but as a reaction to her personal loss of faith that has nothing to do with them. By playing Mary, Seana McKenna pits herself against the memories of Martha Henry in the same role in the 1990s still vivid in the minds of those who saw her. Henry’s interpretation was so definitive that McKenna’s performance cannot displace it. The key difference is that Henry’s Mary was characterized by her fragility whereas McKenna’s is characterizes by her strength. Though all the male Tyrones treat Mary as fragile, McKenna’s take on Mary is that she knows exactly what she is doing and merely plays along with the men’s view of her. Her Mary plays the role of loving wife and mother but the reality is that being prescribed morphine after Edmund’s difficult birth gave her something that has finally made her life bearable – the means of blotting out the memory of everything except the happiest time in her life before she married. McKenna shows that Mary is aware of this cruel truth by her excessive doting on Edmund and on James Sr., but what tortures her more than the men is why she failed the test of faith to be a nun that her mother superior gave her. McKenna’s method of showing Mary’s dual nature of both knowing the harsh content of her thoughts and trying to hide it is to employ two different tones of voice. One dreamy, languid tone she uses when Mary is high, lost in the past or playing the doting wife and mother. The other is lower and hard-edged which McKenna has Mary use to rebuff a direct question. This is effective in one way by showing that Mary, before she takes too much morphine, is more aware of what the men think than she lets on. What McKenna intends is that the harsh voice shows Mary waking momentarily from her drug-induced dream. On the other hand, it also tends to make her soft-voiced reveries seem like an act. The key aspect of playing Mary that McKenna gets right is showing that after every one of Mary’s “naps”, she is even more dulled by morphine that she was before. McKenna’s decision to play Mary’s final scene in a little-girl voice makes it both eerie and disturbing. As James Tyrone Sr., Scott Wentworth is excellent at showing how deep hurt and regret and an outer show of toughness and bravado can exist within the same man. We come to see that James Sr.’s constant sniping at Jamie’s failure is because Jamie represents the failure that James Sr. sees in himself. In depicting the conflicting emotions within James Sr., Wentworth cannot be faulted. The aspect of James Sr.’s character that he misses until briefly in Act 3, is how imbued everything he does is with having been an acclaimed actor. This William Hutt in the role had down perfectly such as using his magnificent voice to intone a statement meant to end an argument. Act 3 shows that Wentworth knows about this aspect of James Sr.’s character. It’s just that Wentworth ought to have brought it into play from the very beginning. Many of his line readings then could be seen as theatrical rather than emotional which would fit better into Potter’s conception of the Tyrones as actors in their own lives, cast in roles they did not choose. The real strength in this production comes from Gordon S. Miller as Jamie and Charlie Gallant as Edmund. Miller’s acting has gone from strength to strength over his seasons at the Festival and his portrayal of Jamie is his greatest performance yet, one that continually reminded me of Peter Donaldson’s in the same role in the 1990s production. Jamie may be an alcoholic and a whoremonger but like the rest of his family his indulgences are due to the enormous guilt and pain he feels. He knows his own mother regards him as the murderer of Eugene, who was the next born after Jamie, a fact almost impossible to live with since he knows it’s true. Lack of love from his mother has made him seek love elsewhere. Failure to be the actor that his great father intended has thwarted any desire in him to try anything. Miller captures all this and shows that Jamie’s outwardly aggressive manner is really an expression of his inward self-loathing. Charlie Gallant, who has been so impressive in his past seasons at the Shaw Festival, gives what is so far his strongest, most complex performance ever as Edmund. Edmund knows the illness he has is not a “summer cold”, although he will say so to Mary to keep her calm, and he knows it is not malaria which he has had before. Gallant depicts Edmund as a young man who has accommodated himself to living under a death sentence. His Edmund knows, especially from the forerunners of existentialism that he reads, that hope is a deception. Beneath his physical weakness, Gallant shows that Edmund is, in fact, the strongest of the Tyrones since he is not afraid of death and wishes to live as authentic a life as possible as long as he can. Gallant uses Edmund’s desire to live an authentic life as the motivation behind his increasing desire to rid the family of its lies and to tell Mary the truth about this disease. Because of this thorough exploration of Edmund’s character, Gallant’s performance of Edmund ranks as the best I have ever seen. The fifth character in the play is the maid Cathleen, who is important in giving us a view of an ordinary person not involved in the inextricable web of the Tyrones. Amy Keating makes her just the breath of fresh air we need, her naïveté and unselfconsciousness acting as much-needed contrast with the Tyrones’ fraught emotions. Peter Hartwell’s set creates the impression of a summer house circa 1912 when the action is set, but does not look as shoddily built as Mary constantly claims it is. Lighting designer Steve Lucas subtly depicts the passage as the title proclaims of day into night but also gives us the impression of the ever-present fog that surrounds the house. Verne Good’s sound effects are essential since the foghorn and presence of the sea acquire a symbolism necessary to understanding the play. 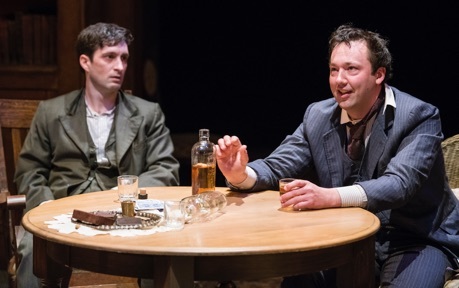 Anyone who has never seen Long Day’s Journey before will not go wrong in seeing this production even if it not as emotionally wrenching as it could be. Those who have seen the play before will find that the work is so rich there is always more to learn, especially when the two brothers are so well played as here. Three-and-a-half hours may seem long for a play, but when it is so involving as this, the time passes by almost too swiftly. Photos: (from top) Scott Wentworth as James Tyrone Sr. and Seana McKenna as Mary Tyrone; Seana McKenna as Mary Tyrone and Scott Wentworth as James Tyrone Sr.; Charlie Gallant as Edmund and Gordon S. Miller as Jamie. ©2018 Emily Cooper.